TV's That Motivate Sales Staff? Directors and managers at most UK businesses know that growth depends on sales department performance. Managing a sales team can be tricky at the best of times and is often a balance of carrot and stick to maintain control and motivation. Typically, we see companies where some sales staff perform exceptionally throughout the month yet others only seem to get into gear towards the end of the month (or target period) when reality dawns on them and they realise that, without a lot of effort, they are going to miss their sales target. Another headache for the manager is that sales people often become too focused on just the sales target and the job of a sales manager is often to remind them to invest effort throughout the pipeline, such as in calls & appointments, otherwise sales targets will be impossible to reach in the future. TV Dashboards provide sales teams visibility throughout the sales cycle, motivating staff and informing management of real-time performance vs target. Sales people by their very nature are &apos;focused individuals&apos;, so making their sales targets more visible and more public really enhances their motivation to succeed and be a visible success in front of their peers. Visible targets = motivated sales staff = better sales team performance. At the end of the month, when the sales figures are in and the numbers are tallied, it&apos;s too late to fix what may have gone wrong as the month has passed. 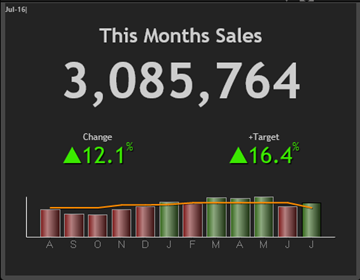 By connecting up a live sales dashboard you can chart real time progress against targets allowing you to take positive actions earlier and have no month end surprises. Leaders of top companies respond faster, when performance starts to lag, not after it has lagged for a full month. Sales people, being so focused, often forget about the full range of activity they need to undertake to ensure that not just this month&apos;s target is being met, but also the targets well after that. Connecting your dashboards to the call-tracking and CRM systems allows a sale person to see all their activity in one place alongside activity targets. This makes the business more process driven and the salesperson more accountable for their actions throughout the sales cycle. Spot process weak-spots by visualising pipeline flow, from start to finish. Almost every business we have worked with has, at some time, had issues with the quality of their data, often with CRM entries not filled in and activities not logged. Once this data becomes inaccurate the validity of the whole sales reporting process comes into question. 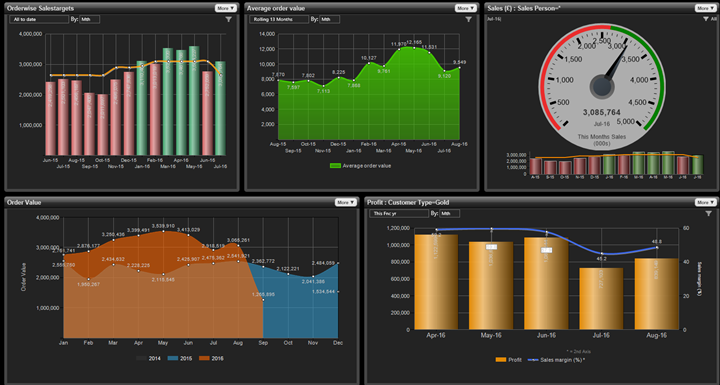 By making recorded activity become part of a public TV dashboard it helps drive the data accuracy. For example, if a sales person is targeted to make 20 customer calls per day, then the TV dashboard can show this target initially red, then going green only if the target is on track or met. This incentivises the sales person to accurately enter the data, otherwise they won&apos;t get the credit for it on the dashboard. Building your sales TV dashboard requires a little thought. A typical mistake people make is to try and cram too much information into the space. Just as Debussy said that music is the space between the notes, so too dashboards require whitespace - otherwise there&apos;s too much detail, which people then ignore completely. We recommend that you apply our "dashboard 10-foot rule". 10-Foot Rule: Layout everything as if most people will view it from 10 feet away. Additionally, it is import to consider that that is something that is running always in the background of your sales environment. If you choose to show it as a PowerPoint style rotating slide show, then any more than 3-4 slides each with a 6-10 second delay will cause people to ignore the TV over time. If you imagine 4 slides each of 10 seconds, then you will have to look at the dashboard for 40 seconds to see everything, and you have just 10 seconds to read and take in the data before it is removed. As a result, I&apos;m personally not a big fan of the slideshow style unless the data is very simple. Instead, I recommend more static views. If you need to show more information, consider buying two wall mounted TV and showing two different static dashboards. The uptake of two static dashboards will be substantially greater than the single slideshow approach. 2 static dashboards are better than 1 dashboard slideshow. Picking the right data is key to your successful sales dashboard. In the majority of cases the core data is going to be your sales orders. Ideally you will want to connect your dashboard software directly to your sales order system such as Sage 200, Orderwise, SAP etc. This will enable you to get a real time view of sales as they flow in. Most sales systems don&apos;t manage targets, and this is where your dashboard app should do the work for you. Ideally we want to push all our sales orders into a dashboard so that we can total up sales value on the day, week, month or quarter as appropriate. This makes cumulative running totals easy to display and share on your dashboards, but what about targets? Targets can, and usually should, be the guiding vision of your company or department. In the case of sales teams, targets are typically per sales person or sales team and have are commonly set daily, weekly or monthly. More often than not these sales targets will be stored in an Excel spreadsheet and managed periodically by the sales manager. Of course there are also department goals set by the Board and reported up the company hierarchy, with sales revenue versus target as one crucial piece of the organisational picture as a whole. Integrate a single, auto-updating, dashboard view, of both sales order systems and sales targets for consistency and ease of management. 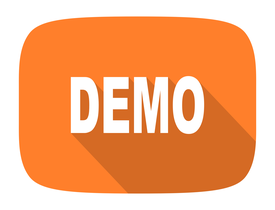 The trick here is picking the right dashboard software that can mixed together real-time sales order data from one system, with a fixed frequency target, where the source is typically Excel and therefore very easy to edit and accessible for the manager. At the core of leading sales organisation dashboards is the merging of two separate sets of data, sales orders and sales targets. It important to also consider other types of data associated with individual or team sales success. At the end of the process are actual sales - this is the obvious one. But, before this more often than not, came appointments, emails and calls. Without these activities, future sales targets will likely not be met. One key to a good sales dashboard is to provide information that motivates all activities necessary to the sales process, with sensible target levels. Motivating all activities which are part of the sales cycle is key to ongoing success. Quality dashboard software will link to your separate CRM system or phone system, or both, so that this activity data can be presented alongside the more obvious sales figures. With more CRM systems now being cloud-based, make sure the dashboard system you pick can regularly collect data from the internet as well as the in-house and excel sources - automatically. Settle for nothing less than integrated real-time, cloud-based, order systems as well as static spreadsheet targets and supporting data. It is essential that you build dashboards for the right environment. What works for one situation is wholly unsuited for another. In other posts we will cover other dashboard categories, but here our main focus is the TV dashboard. Applying our 10-foot rule means that we want to make everything we display big and bold. For example, while a chart like this (below) might look good on a management dashboard, it&apos;s too detailed for a TV. Avoid the trap of trying to fit too much information into the available space. Digital Gauges are one of the most effective visual choices for TV displays. Learn how easy it is to use Target Dashboard for improving sales team performance and to build a competitive advantage. 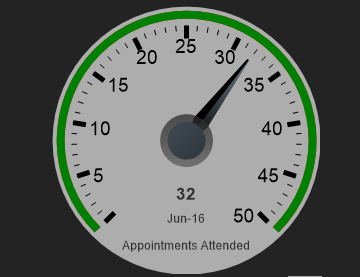 One downside of gauges is that they take up a lot of space on the screen to present just one single piece of data. By using a graph you may find that you can clearly present more information in the same area. Traffic Light Charts can convey more than gauges, without sacrificing readability. The visuals you choose really depend on the nature of your sales data and the size of your sales teams. So it pays to experiment with different approaches until you get the view you want. Try, test, explore and experiment and/or speak to a Target Dashboard expert who can help recommend the best way to convey your KPI&apos;s.
Always remember to limit the information. As dashboard that tries to show too much will soon be ignored because it&apos;s hard to glance at, so better to build multiple TV dashboards. One example of this might be to having one TV show your sales times current Sales vs Target and another TV showing the trend over time of their sales. Glance Test: Ability of your target audience to glance at a TV display dashboard and pick out information of interest within a handful of seconds. We have experimented with many "smart TVs" that include a built in web browser. We have mostly found them a poor solution because they can&apos;t be set to turn on directly into the browser and need multiple complicated remote presses in the morning to start the dashboards. We have found that the best approach is a low cost TV with a simple HDMI port. Then this can be connected to an old laptop or a device like a Raspberry Pi that will provide the web browser functionality. The big advantage of this is that you can simply turn on the TV screen and the dashboard is there waiting for you. An old laptop or Raspberry Pi is easier to use with any wall-mounted TV than most "smart TV systems" of today. 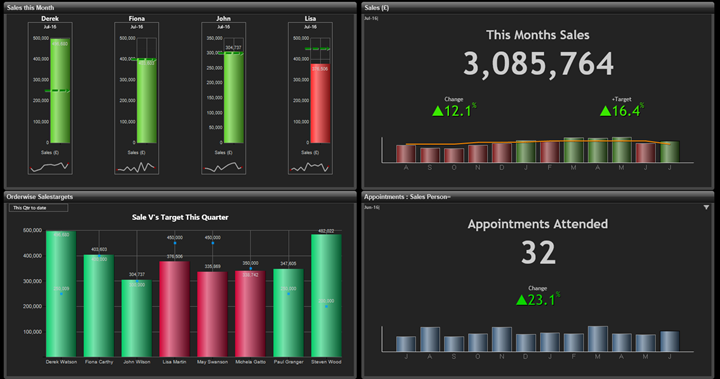 Dashboards, in a sales-driven environment, have very large ROI. They help maintain control and motivate sales staff so that meeting your sales targets becomes routine. If anything is off-target, you can see early so as to quickly focus on the issue and resolve, before it becomes a major end-of-month shortfall.